The perfect gift for the Warwick fan. Thumb Bass. Before an item is listed (electronic), it is power tested it if it requires power, and if it is a motherboard it is tested in the system before dismantling, or if it is a peripheral device that we can test on or in a system we do. This is short-lived production model was modeled after John Entwistle’s Alembic/Explorer design. Warwick was given a direction of cease-and-desist from Gibson because of the copied shape. through design. Swamp ash body in Nirvana black finish. 34” scale, 3-piece Ovankol neck, Wenge fingerboard with German bell brass fret wire. Adjust-a-nut II. Warwick 9V active preamp with 2 band EQ. The tonal options on this bass are many. Light scratch near the pickup, see pics. Works great and sounds great. I am also including a whole bunch of extras in this sale to sweeten the deal! Priced to move! Thumb pick. Excellent condition! Small mark on the treble side of the 5th fret, doesn’t effect playability at all. Upgraded to Gotoh tuners with drop tuner! Includes full Warwick User Kit, Certificate of Authenticity and Warwick Flight Case! Used for home demos/practicing over the years and stored safely in a cool dry room. It's in great shape and never used for gigging. Feel free to message me if you would like more pictures or information! New Listing2018 Warwick Rock Bass Corvette $$ (Double Buck) 5-String Bass Mint! WOW!!!! This is really cool. Case not included. • Warwick machine heads. • Warwick two-piece bridge. • Warwick security locks. • Swamp Ash body. • Scale length: 34" (long scale). Dripping with "Mojo". Here’s a $$ in fantastic condition, Nirvana black. Standard $$ config of Twin humbuckers in the sweet spot with taps and p/s switch. 3 band eq with push/ pull bypass. Ash body, ovangkol neck, wedge fingerboard. This is a great axe, and sounds like anything you can dream up, it’s in super shape, and I hate to see it go but gotta thin out my collection. It will come packed inside the softcase with care, strings loosened and freshly hydrated and set up. Currently has 45/105s on it. There’s a lot of threads and vids out there on this bass, so I won’t really go into those details. It will come w a case& strap. Beautiful Warwick fretless 4-string bass. WARWICK ROCKBASS CORVETTE 4-STRING BASS ~BLACK~ GOOD CONDITION Free Shipping!! ROCKBASS CORVETTE. 4-STRING BASS. BUT IN GOOD CONDITION OVERALL. WARWICK GERMAN 6 STRING CORVETTE BASS Made in 2001. Bubinga body, Ovankol neck w/ drop tuner. Very well taken care of. Comes with hard shell case. Each is made with the combined love and experience of our team of qualified luthiers and accomplished master- builders. Warwick RockBag Gig Bag . 2-Piece Warwick bridge. Warwick security locks. Adjustable Warwick "Just-A-Nut III" nut. Great for any style player. Finish: Brown Highpolish. Body wood: Maple. The Music Farm is an Authorized Warwick Dealer. The guitar pictured is the actual guitar you will receive! Snare Drum Size String Gauge Bass Drum Size String Type String Material Key Features. Equipped with the Fishman Sonicore and Sonitone system, the simple and convenient electronics bring out the Warwick acoustic bass's tone with authority. This material provides excellent acoustic reproduction. The Corvette Standard is beautifully made and has that characteristic low growl for which Warwick basses are famous. As with all Warwicks, the bass features premium tonewoods throughout: a bubinga body and 3-piece ovangkol neck with wenge fingerboard. Shows only mild wear from normal use. This is for your protection as well as ours! Electronics all work properly. The neck is straight with no issues. Warwick Thumb 5 Neck-Through 5 string bass guitar. A few small random dings on body but nothing deep or needing repair. Guitar is fresh in from Warwick. Warwick machine heads. Warwick two-piece bridge. Warwick security locks. We know the value of personal service and encourage you to give us a call; you'll actually talk to a real person! This bass is in very good condition with a few dings & scratches. Features: Swamp Ash Body & Wenge Fingerboard. Serial #: J146524 08. Made in Germany. Specialty Traders is an Authorized Warwick Dealer! Machineheads: Warwick Machine Heads. Bridge system: 2-piece Warwick Bridge. Strap system: Warwick security locks. String label / gauges: Warwick Red Strings. On the Alien Deluxe, you get a solid Sitka spruce top and beautiful Walnut (laminated) back & sides. It has an integrated Fishman amplification system, which includes a Fishman Sonicore under-saddle piezo and a Fishman 3-band active PreSys preamp. Body: Contoured, solid carolena body in natural finish. Bass weighs 9 lbs 4.7 oz. What makes this bass special: A remarkable entry-level 5-string bass with exceptional sound & playability usually found only in higher end basses. Electronics: Passive Rockbass electronics. Bridge system: 2-piece Warwick Bridge Strap system: Warwick security locks. Specialty Traders is an Authorized Warwick Dealer! Machineheads: Warwick Machine Heads Nut: Just-A-Nut III. Zipper on bag broken. KOHNS BEST BUYS INFORMATION If you receive an item that is incorrect or has a problem with it. If the item does not match what we described it as. We want to make sure you are satisfied with our service and products. 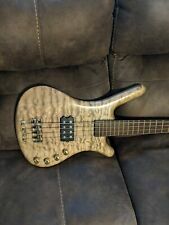 2004 Warwick Corvette Standard 5 String Active/Passive Bass. The following can be verified by entering the Serial Number on the Warwick web site. Corvette Standard, 5-string. Thumb wear on body at the top of the "B" string. For sale is a like-new 2018 made-in-Germany Warwick Corvette with upgrades. The bass also has two 3-way switches for series/single-coil/parallel switching. All of the hardware is original except for the knobs which are the ones supplied with the Seymour Duncan preamp. Warwick machine heads. Warwick one-piece bridge. Warwick security locks. High Polish Finish. Scale length: 34" (long scale). Carolena body. Up for sale my 2009 Warwick Alien Acoustic/Electric bass. I bought it new from an authorized dealer. Warwick's owner's manual and tools binder included. Warwick tuners. Warwick security locks. The Alien fills the gap between the double bass and the electric bass. A few light buckle marks on the back. The neck is straight with no issues. Fingerboard is in fine shape. This is for your protection as well as ours! There is a little wear where one's arm might rest, and very minimal pick wear on the bottom side. There is one tiny dent in the lower horn but I didn't notice it until I took the photos. Overall, this bass has been well cared for. But the Rockbass is a beast that has a sensitive side too. Warwick machine heads. Warwick two-piece bridge. Warwick security locks. Chinese Ash body. Scale length: 34" (long scale). Fingerboard radius: 5-string = 500 mm (20"). 2009 model with the thinner neck and it sounds amazing, very smooth and easy to play! This bass is used and in great shape with a few dings on the body as shown. No case included. Up for grabs,it is a very RARE AND HARD TO FIND short run 2000 Warwick Custom FNA corvette jazzman 4 strings. bass guitar,, these were produced in 2000 and not available right now. You won't find many Warwick's with. Closed gear Warwick machine heads keep it solidly in tune. The bass's 1-piece bridge provides great action for beginners and experienced players alike. Combined they create an aesthetically pleasing bass guitar that is as enjoyable to play as it is to behold. Very nice shape. Plays and sounds killer. 5 String Bass Guitar. Neck joint: Bolt-on. Body wood: Ash. Scale length: 34". Series or parallel: Switchable. Shape: Info not available. Nut material: Bone. This will give you access to our daily specials. SKU: KM84 – Manufacture: Warwick. The Corvette body shape, introduced by Warwick in 1992 with the creation of the Corvette Pro Line, is without doubt the first place to start as a bass player. Case not included. BASS GUITAR: WARWICK MODEL ROCKBASS, 5 STRING, RIGHT HANDED. Type of Bass Guitar ELECTRIC. Number of Strings 5 STRING. Knobs - Tuners - Electronics - Input Jack 95% - Guitar is like new - Very little wear - All original. The bass guitar is an instrument commonly heard in almost every genre of music. A variant of the standard guitar, bass guitars have thicker strings, are tuned one octave below a guitar, and generally have four strings rather than six. You can also find 5-string bass guitars. Warwick is a brand of bass guitar manufactured by the company of the same name. Warwick was founded in Germany in 1982. Outside of Germany, it has custom guitar shops in Shanghai, China, and Nashville, Tennessee. In addition to bass guitars, the company also manufactures speaker cabinets, amplifiers, and bass guitar strings. Where are Warwick bass guitars made? A bass guitar from the Warwick brand may be made in one of several countries depending on the series of guitar. Custom shop: These Warwick basses are handcrafted in Germany. Pro series: Each of these guitars is team-built in Germany, though some previous and vintage models in this Warwick branch were crafted in Korea. Rockbass standard: A bass guitar from this series is usually made in China. What types of body styles do Warwick basses come in? Are Warwick basses available with five strings? Basses made by Warwick come with various string options. Although four-string bass guitars are the most common, Warwick has many five-string models in a variety of body styles. Warwick also has less common six-, seven-, and eight-string basses, although the body styles for these options are more limited. What type of wood does Warwick use for its basses? Does Warwick offer an acoustic bass guitar? Warwick produces a number of acoustic bass guitars, including four-, five-, and six-string variants. The bodies are typically made of spruce with mahogany. Although acoustic basses have a hollow body like an acoustic guitar, they usually have an electronic component that allows them to be connected to an amplifier. Content provided for informational purposes only. eBay is not affiliated with or endorsed by Warwick.